Kathy Butler was born in Edinburgh, Scotland and moved to England then Canada at 11 and again to the United States for University. As a result she has two citizenships (British and Canadian) and a green card to live and work in the US. 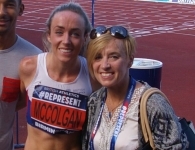 After graduating from the University of Wisconsin in 1997 with a degree in Exercise Physiology and Biology (Dean’s list and Academic All-American), Kathy became a volunteer assistant coach at both the University of Wisconsin and Stanford University and it became a great compliment to her own running career. In 2005 Kathy moved to Nederland, Colorado to live in the mountains and train at altitude and began coaching the high school track and cross country teams in Nederland. Watching Coe and Cram run the 1500m final in 1984. I was a multiple time Canadian and British champion in Cross Country and 5000m/10000m on the track. 5 time NCAA Champion, Competed in 20 World Championships in Cross Country, Track and Field and Road including a 4th and 11th at World Cross Country. Two time Olympian (’96 and ’04). I now have my USATF Level 2 in Endurance as well as Sprints, Hurdles and Relays. By September 2014 I expect to have IAAF Level 5 / USATF Level 3 in Endurance, the highest coaching qualification available internationally in Endurance. I’m also qualified to coach USATF Level 1 coaching courses. In addition I have UK Athletics Level 2. What are your coaching philosophies and how were they shaped? My philosophy is to coach the individual with a long term perspective. I always like to look at long term goals first and then work backwards. I think it’s important to always have a structure to training and a reason for doing the training that an athlete is doing. I also like to think of the person first as this effects what they are able to accomplish athletically. I think I have been fortunate to have great mentors in Peter Grinbergs, Peter Tegen and Steve Jones who all emphasized these same philosophies. One of my high school girls winning a state championship in the 800m, while I have had athletes win many state titles this one was special because no one expected this girl to do as well as she did all season. I would like to continue to build my elite and post-collegiate athletes as well as work more with USATF, British Athletics or Athletics Canada. I’d also like to get back into coaching in the NCAA. You have coaching qualifications from both the UK Athletics system and the USA T&F system, wWhat do you think are the biggest differences in the way the UK and the US educate their coaches? I think that in the US there is a bigger emphasis on doing the coaching education in person. A lot of the British system seems to be done online at the moment. Considering the geography you would think it might be the opposite! I think from a knowledge sharing, networking and coach cooperation perspective having coaches get together in person for education, conferences and seminars is really good. However, I understand that logistics make online convenient for many. Do you coach male and female athletes? If so, do you find you have to adapt your coaching style to coach girls/ women or boys / men? I coach both male and female athletes. I think that girls and women like to talk about things a lot more and tend to need more reassurance that things are going well. However, boys and men tend to have these same underlying anxieties they just prefer to prove it to themselves athletically. I do feel like there is a lack of female coaches and leaders. In all of the coaching education I’ve done women usually make up about 10% of the attendees and an even smaller percentage of the educators or instructors. I don’t think I have experienced discrimination from an administrative perspective but sometimes I feel there is a little bit of an old boys club with the other coaches. However, I think with the right approach this is easy to overcome as they tend to be nice people who are coaching for the right reasons. I think more female coaches teaching coaching education as well as coaching in the collegiate and post-collegiate professions is needed.